Do you know our evacuation routes in the event of fire? Or the best way to protect yourself and others from an active assailant? Please take a few minutes to read our new Emergency Preparedness and Response Plan. You can also pick up a hard copy of the Plan in the church office. Drafted by a task force of our Trustees and approved by Church Council, the Plan provides guidance on preparing for and responding to the many types of emergencies that can occur in churches as elsewhere. Church staff, leaders, and community groups will also be offered situational and awareness training under the Plan. What is an emergency preparedness and response plan? 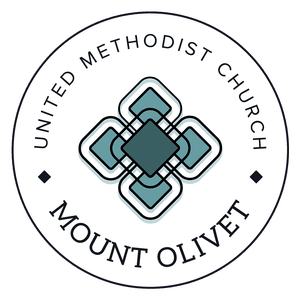 Mount Olivet United Methodist Church seeks to be “Inclusive. Life-Changing. Serving” and has a very active ministry in the northern Virginia area and globally. Diverse in age, background, and life experience, we strive to be a place for our congregation and community to gather safely, grow in discipleship, and go out in service. In caring for the body of our Church, we acknowledge that emergencies will happen and properly plan for them. Mount Olivet has experienced many emergencies over the years that required immediate action, such as medical emergencies, fires, and severe weather events. Moreover, recent events have demonstrated that we need to be prepared to respond to the full spectrum of emergencies, including gun violence. 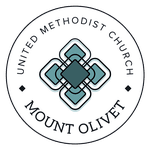 This plan provides broad guidance to church staff, ministry team leaders, members, and others involved in activities on the grounds of Mount Olivet United Methodist Church on preparing for and responding to an emergency situation. The church’s Trustees will update this plan as often as necessary, but at least every three years. Life Threatening Emergencies: those that involve significant risk of bodily harm to persons and exceed the reasonable response capabilities of the church staff and others. These emergencies will most likely require immediate intervention by medical, law enforcement, or fire professionals. Non-Life Threatening Emergencies: those that do not involve significant risk of bodily harm and can be handled by church staff or other trained people in the immediate vicinity at the time of the emergency. This category, which may also require the intervention of medical, law enforcement, or fire professionals in many cases, includes facilities related issues such as flooding, weather related damage, and similar situations. It is important that church staff, ministry team leaders, members, and others who frequent Mount Olivet familiarize themselves with this plan. In any type of emergency, the safety and well-being of others is the priority. People first - stuff later! Remain calm - evaluate the situation - take action. Always call 9-1-1 whenever you feel that you or other people are in immediate danger. There are panic buttons located throughout the church and should be used if necessary. Keep your eyes, ears, and all other senses alert and be aware of what is happening around you. What is that funny smell? Why does this feel wrong? What is causing that weird sound? What is happening to that person? Use your best judgment, especially when something doesn’t fit into pre-arranged procedures. If told to evacuate the facility, head to the nearest designated assembly area. Our designated assembly areas, depicted on page 12, are the “green” at the corner of Glebe and 16th St. N. Road, the cemetery, and the playground off of Glebe Road and 15th St. N.
Evacuation routes (primary and alternate) are located on pages 15-17. If possible, stay on the line until help arrives. 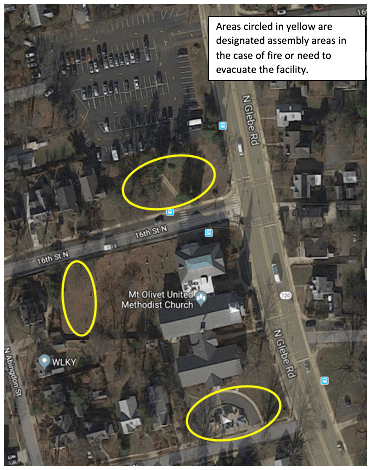 This plan attempts to align with other emergency plans in existence at Mount Olivet in order to ensure consistent actions and minimize conflicting guidance. Mount Olivet Preschool and other regular users of the facility should develop a separate emergency preparedness and response plan. Groups should forward a copy of the latest version of their plans to church staff within 30 days of approval. Upon approval of this plan, Trustees will ensure all church staff, members, and groups using Mount Olivet’s facilities are made aware of the plan’s contents within 6 months. New church staff will become familiar with this plan within 90 days of hiring. In addition, Mount Olivet will ensure that Church staff, ministry team leaders, ushers, and greeters are aware of the location of, and how to use, the Church’s panic buttons, fire alarms, security cameras, and first aid resources. Periodic or situational awareness training is encouraged. Examples of traumatic medical emergencies would include: death, attempted suicide, heart attack, accidents causing serious injury, or anything else likely to cause severe emotional or physical harm. All non-essential people should be kept away from the scene of a traumatic medical emergency until the scene is released by professional responders. While waiting for professional help do not move the ill or injured person unless safety considerations necessitate movement or transportation to a safer location. Send a person outside to flag down emergency responders and show them where to go. If a person is trained in the use of an automated external defibrillator (AED), there are two units in the church. One AED unit is outside the sanctuary door on the main level and a second AED unit is located on the lower level outside of the youth area. If no spouse, parent, next-of-kin, or other responsible adult acquaintance of the ill or injured person was present during the emergency, notify them of the occurrence with the help of church staff or knowledgeable members. Do not attempt to make a medical diagnosis of the problem. Tell them what happened and what hospital the person was taken to. If the emergency was caused by an accident or injury, help the church staff get appropriate information for its report to insurers and others. There have been several fire mishaps in the church over the years. A map of the church grounds with designated assembly areas is on page 12. 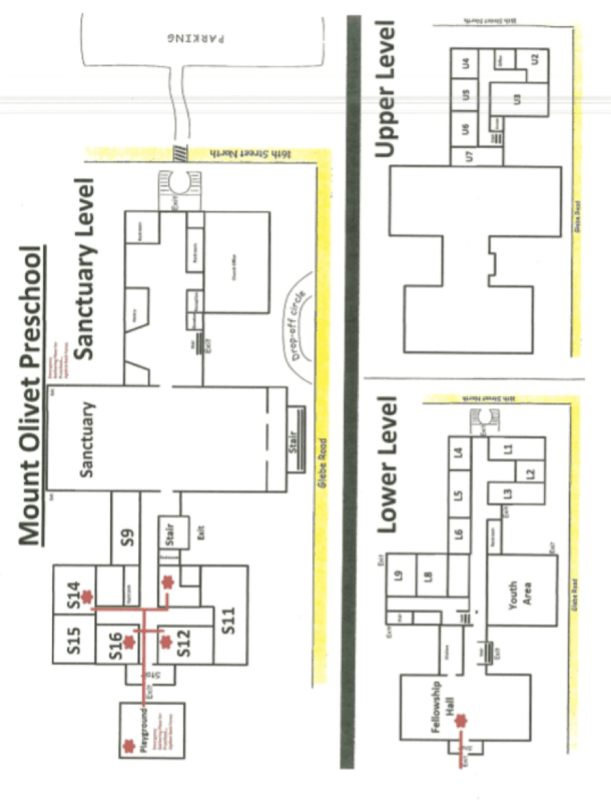 A plan of the church building with marked evacuation routes (primary and alternate) and locations of the fire alarms/ extinguishers are on pages 16 and 17. In the event of a fire emergency, people should pay particular attention to the large metal fire door in the Gathering Space outside the church offices. If the alarms are activated, the door quickly slides closed to prevent further spread of the fire. The sliding door may present a danger to people attempting to exit while it is closing or cause distress to those who become separated from the others once it fully closes. Implement DROP, COVER, and HOLD! All people should immediately move away from glass areas and get under sturdy tables, desks, or pews. Be aware of large panes of glass and heavy, suspended light fixtures. When the earthquake is over, evacuate the building to the nearest designated assembly area. Staff or emergency officials should check all utilities to ensure all gas, electric, water, and sewer systems are operational and safe before reentering the building. The safest place is in the open, away from any potential falling objects (e.g., trees, power lines, buildings). Stay in the open until the earthquake is over. Do not re-enter any damaged buildings until church staff or emergency officials deem them safe. A bomb threat exists when a suspected explosive device has been reported, but not located. A bomb emergency exists when an explosive device has been located or actually exploded. If a suspicious package is found, DO NOT TOUCH, MOVE, OR IN ANY WAY HANDLE IT! Gas leaks may produce a hissing sound and people near the leak will notice a foul smell similar to rotten eggs. Gas leaks can be very dangerous depending on how long it has been leaking or the size of the leak. All personnel should vacate the building. Hazardous chemical spills could present a similar risk to people in the church. Do not operate any electrical switches during evacuation. This includes, but not limited to wall switches, plug in items, computers, etc. The first few seconds are the most important time when trying to protect yourself and others from an Active Shooter, or a person brandishing a dangerous weapon. Every situation is unique, but the Department of Homeland Security Active Shooter training resources describe a reasonable approach to protecting your life—RUN, HIDE, FIGHT. Law enforcement officers will act to stop the active shooter as soon as possible. They may be armed with many weapons and wearing tactical equipment. Officers may shout commands and push people to the ground for their safety. The first officers on the scene will not stop to help injured persons until the threat is contained or eliminated. Do not attempt to stop officers to ask for help or an explanation. It is best to remain on the floor with your hands visible and empty. Avoid any quick movements toward officers or attempting to evacuate in the direction from which officers are entering the premises. Civil unrest may result when people are protesting, challenging authority, committing acts of vandalism, gang activity, etc., to the point where the safety of the staff and others at the facility is jeopardized. The goal is to protect all people on site from injury or harassment until proper help can be summoned, and to keep property loss and damage to a minimum. Water can quickly damage facilities and equipment. A small leak can become very costly if it goes unreported for a long period of time or the pipe bursts. Any suspected or identified leaks and flooding should be reported to the church office immediately so the situation can be remediated. Non-life threatening medical emergencies can be caused by an accident or other source of injury. Examples include severe cuts, broken bones, scrapes, and falls while on the premises. Church staff, family, or trained medical professionals on site may have time and resources to address the situation adequately. This should not be interpreted as restricting the use of emergency services or calling 9-1-1 whenever appropriate. If you witness, or become aware of, a medical emergency, please notify the church office immediately after all of the injured are safe or receiving medical care. The church staff may need details related to the incident to complete the required accident reporting. Church staff, ministry team leaders, members, and others involved in activities on the grounds of Mount Olivet should familiarize themselves with evacuation routes (primary and alternate), designated assembly areas, and locations of fire alarms and extinguishers. A map of the church grounds with designated assembly areas is on page 12. A plan of the church building with marked evacuation routes and locations of the fire alarms/extinguishers are on pages 16 and 17. Proceed out one of the four marked exits (one on each wall), exit the building, and walk to a designated assembly area. Proceed around corner to Playground Entrance, down stairs, and exit building to playground. Alternate Route: Proceed down the hall, into the Sanctuary, to stairs on the left side of altar, exit building, and walk to cemetery. Proceed down the hall, into the Sanctuary, to stairs on the left side of altar, exit building, and walk to cemetery. 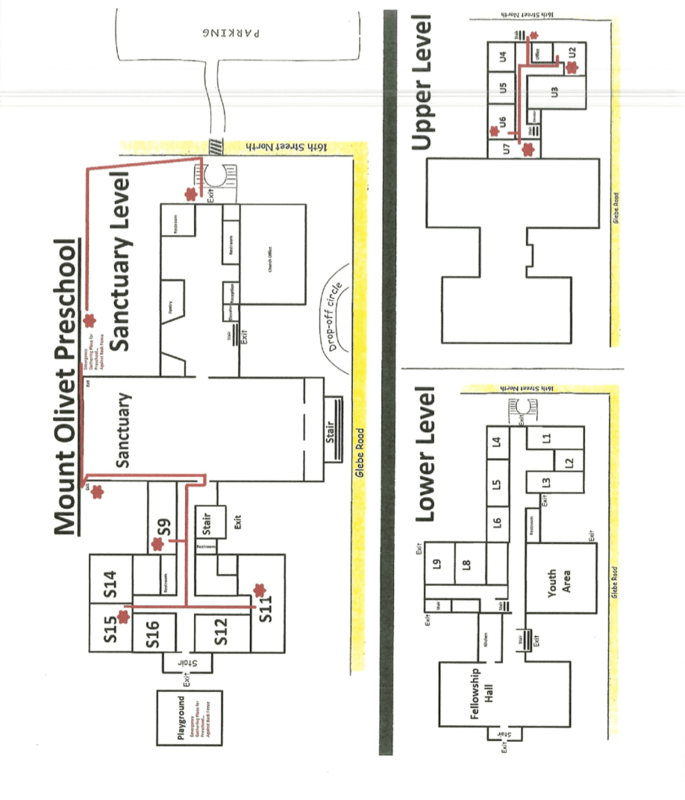 Alternate Route: Proceed around corner to Playground Entrance, down stairs, and exit building to playground. Proceed down hall toward 16th Street Stairwell. Walk down stairs, exit the building, and walk to cemetery. Alternate Route: Proceed down hallway, through door to the Glebe Road, down stairs, into the Sanctuary, to stairs on the left side of altar, exit building, and walk to cemetery. Proceed through Playground Entrance, up the stairs, and exit building. Walk to playground. Alternate Route: Proceed down hallway past the kitchen, up the few stairs on left, walk down L8/L9 hallway, exit building, and walk to cemetery.